Alfred E. Nelson served in the Civilian Conservation Corps at Rabideau Camp No. 708 near Blackduck from 1936 to 1938. He summed up the benefits of his experiences in an oral history interview conducted in April 1976. I've thought about it a lot, and I don't believe the army regulations hurt the boys at that time. I think it made men out of them. I've talked to a lot of the boys and they feel the same way and the experiences of everything right straight through. I think made better men out of us. And they're all very conservation-minded; we have a bunch of conservationists that came out of there. I think the Army discipline was a wonderful thing at that time. The boys were young, the first time away from home. They learned discipline and respect. There are some fine boys that have turned out of the CCCs. Education building at No. 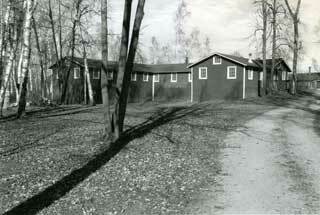 708 Camp Rabideau, 2002.